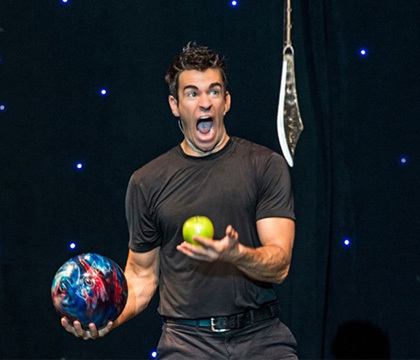 The best family friendly comedy show By Jeff Civillico has come down to Vegas , having kicked off on June 7th.The renown comedian has brought his splendid humor to Vegas in an afternoon of a thousand laughs at the Flamingo Las Vegas. His show is a blend of jokes and physical humor together with stunts. This artist who was named 2015’s Entertainer of the Year has performed from Disney resorts to the White House. This show features his stunts, him juggling bizarre objects all at once plus more daring onstage moves. This event is family friendly but it also features a night club inspired segment. Whatever mood you arrive with at this show, you are guaranteed to live in a mellow mood. According to Total Vegas Guide, Jeff Civillico is one of the top ten things to do in Las Vegas. Civillico is an all-star comedian who started performing Comedy in Action in Vegas in 2009.He is juggler, corporate entertainer and comedian based in Vegas. He was engrossed in juggling from a tender age and started performing at preparatory school. He founded the Juggling Club at St. Joseph’s Prep school and started performing with other members often for free. He received a gold medal from the international Juggler’s Association when he was only 15 years. His performances in the period from 2008 included at the Modesto’s Gallo Center for Arts in which he was described as the greatest juggler in Hollywood. He also got to perform at the White House and the Kennedy Center, plus several other performances for Disney Cruise Line. When he moved to Vegas he first started performing for the show called Amazed. After a short time however he started his own show; the Comedy in Action which he has been running to the present. He moved the show from Planet Hollywood Resort and Casino to LINQ and later to Flamingo, where the show is currently held every week. He is praised for his energetic performances and his ability to captivate and engage the content. He has the ability to make impromptu comedy plus his juggling talent is just next level. He is known for picking out the most reluctant member of is audience for an on-stage stunt. This way he is able to convert the uptight audience members into diehard fans. His humor is self-deprecating that only makes the audience identify more with him, finding his jokes humorous and relevant. He seamlessly makes the audience part of his performance that gives the kids and their parents something to laugh about and to remember when the night ends. It is important to note that Jeff Civillico is the founder of the nonprofit organization Win Win which is focused on providing entertainment to charity organizations. This organization makes it easier for charity organization to get quality entertainment by addressing common problems such as stage set up and sounds by providing important equipment. Win Win has so far helped organizations like American Cancer Society and The Shade Tree Shelter among others. Civillico is known for odd moves with his street performer skills and energy. He is all about connection with the audience in a fun and playful manner. When it started in Vegas, Comedy in Action was a one man show for six months before Civillico decided to have assistants. His remarkable rapport with the audience is the source and fuel of his acts, as his juggling will create for you an optical-illusion-like feel. He distinguishes himself from others by considering himself more than just a juggler. He is a performer, someone with a sense of humor. Through the years he has perfected his skills and gotten his act together, his name has always been synonymous with performing arts wherever life takes him. His comedy is so unique and originating from every aspect of life. He combines jokes, balancing, athleticism, audience participation, stunts and juggling all in a single scoop to captivate his audience, a begrudging fact to critics. Few entertainers have the magnetic power that draws and keeps the masses for years like Jeff Civillico. Jeff holds the world record for bungee jumping on his unicycle off a cliff in New Zealand. Jeff gives amazing entertaining performances and is also a great emcee. He has simply branded his passions and personality to create for himself a successful career and lifestyle. Las Vegas plays host to spectacular concerts and events. Comedy in Action guarantees you a funny performance which will leave you with a big smile. Several years down the line since he started the show and funs still complain of cracked ribs after his performances. His unmatched comedy leaves audiences laughing out loud. The Flamingo Las Vegas is a hotel and Casino located on the Vegas Strip. The hotel is owned and operated by Caesar’s Entertainment. The architectural theme is Art Deco a d Streamline Modern style. This is the oldest resort on the strip and it features a garden courtyard housing a habitat featuring flamingos. This hotel is known for entertainment, hosting TV shows and concerts. One of the current headline shows at the Flamingo includes Donny and Marie Osmond. The show is rated as the best of Las Vegas. It is no doubt that you can expect a non-compromising powerful performance from Civillico in Vegas. If you have attended his previous shows you already know this, but you can always expect something fresh and unique every time you attend Comedy in Action at the Flamingo Las Vegas.